This vegan coconut pudding is ultra thick, creamy and rich and only takes about 15 minutes to make! In my book, there’s a coconut banana tart with a coconut milk based pudding-like filling. There was already butter and an egg yolk in the crust so I figured it’d be completely pointless to attempt making the coconut pudding filling vegan or dairy-free. So now that I’ve found myself with a little more time, that’s what I’ve done here! Mr. Texanerin thought that this coconut pudding was really rich due to the coconut milk and could only eat a small amount at a time. I, however, can eat the full batch by myself within less than a day. I know this sadly from experience. I didn’t find it overly rich at all but sometimes I find my sense of sweetness, richness, etc. out of whack. It’s pretty thick and stays that way for at least 24 hours. Just don’t be like me and eat from the pot with a previously used spoon or else the pudding may get a little runny. Instead of egg yolks to thicken the pudding, I used quite a bit of cornstarch. If cornstarch freaks you out, Bob’s Red Mill’s cornstarch is GMO-free. 2/26/2016 update: I made this pudding with arrowroot starch several times for a grain-free and paleo version and it worked great! But I just tried it with another brand and the pudding is quite grainy. Until I test a few more brands, I’ll remove the arrowroot option! In a small saucepan over medium heat, stir together 1 1/2 cups of the coconut milk with the sugar and salt. Stir occasionally until the sugar is dissolved. Meanwhile, mix the remaining 1 cup of coconut milk with the cornstarch in a small bowl until well combined. It may appear lumpy at first but keep stirring and it'll combine. Remove the pan from the heat and stir in the cornstarch mixture while stirring constantly.Once well combined, put it back on the stove, turn the heat to medium and cook until thickened like pudding, whisking constantly (do not walk away and do not stop whisking!) This will take anywhere from 30-60 seconds. Do not let it continue cooking once it's thickened - this can cause the cornstarch to break down and will make the pudding runny. Remove from the heat and stir in the vanilla and coconut oil. Let cool until room temperature and then refrigerate in an airtight container. Best enjoyed within 48 hours. Garnish immediately before serving. 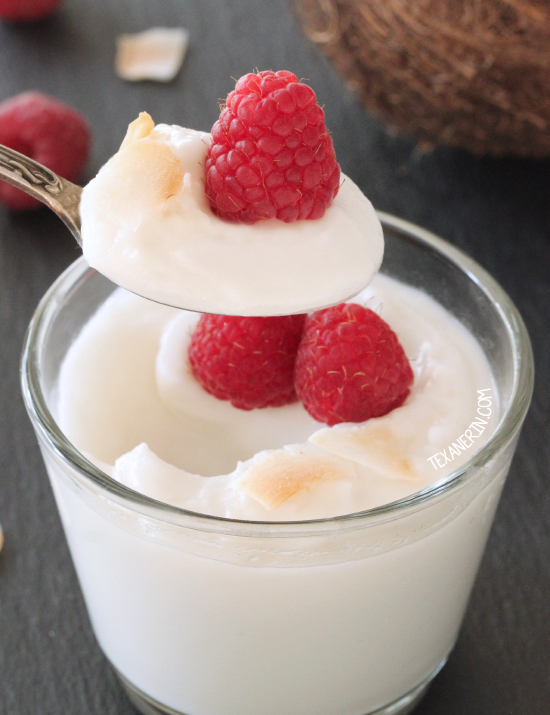 34 comments on “Vegan Coconut Pudding” — Add one! Super yummy! We used arrowroot as it is all we have, and it was not grainy. There is a slight lemony flavor, but we are diving in while it is still warm – we could not wait! Thank you! Awesome dessert..my little one loved it. I used coconut whipping cream for this but it ended up kind of grainy from the cornstarch. I’m thinking it’s because coconut cream is thicker and it needed less cornstarch to bind it. Do you think there’s a fix for this? Thank you! Sorry for the slow reply! By coconut whipping cream, do you mean you took coconut cream and whipped it and used that? If so, I don’t think whipping would have had any effect on it but by just using all cream and not the watery part of the coconut milk, too, that’d probably explain the problem. All I can think of to do at this point is to add more liquid. I know this post is from 2 years ago, but I didn’t see anyone comment that actually made. I made it with coconut sugar and it was so good! Thanks for the recipe! The garnish of raspberries and toasted coconut sounds like the perfect way to dress up this pretty pudding! I’m forwarding this to one of my vegan friends who is also a lover of all-things-coconut. Thanks! :) And thanks so much for sending it to your vegan friend! I am loving this creamy and decadent looking dessert! Since going paleo I have found my love for all things coconut! YUM! My husband and I are like that too! Sometimes I’ll think something is too rich and he’ll love it and then other times he’ll think it’s too rich and I’m all over it! I’m totally digging the roasted coconut chips ontop too!! It looks incredible! 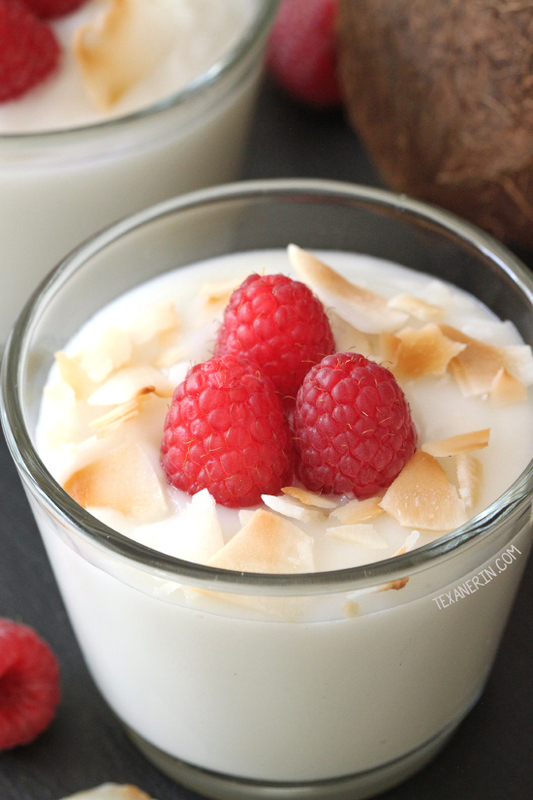 I am obsessed with coconut milk in dessert and I just need to try this pudding recipe. My oldest will love it as she is a coconut fan like me! Anything coconut is for me! Love that you topped it with raspberries – a little tart along with the sweet. Exactly! Such a great combo. I love this! It looks so rich and delicious! The richer in texture the better I like it and this one looks perfect! That looks delicious, so creamy and rich! Love that it is vegan too.